Public Claims Adjuster recovers additional $50,665.00 for Jupiter Florida Policyholder! It was a newer building that luckily had fire sprinklers installed. The fire damage claim was due to a faulty clothes dryer and was apparently put out rather quickly by the fire sprinkler system. 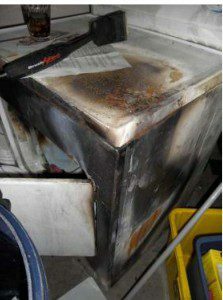 The actual fire damage was minimal, however, the ensuing water loss and smoke damage were not. We were called out to meet with the insured soon after he met with the insurance companies adjuster at the property. At this point, he did not know what they were going to do but he did not feel comfortable with his adjuster and suspected there would be problems in the future. After interviewing several public adjusters, he retained our firm to assist him with this claim. When the offer finally came in, it was for $9323.45. This was shockingly below what a reasonable offer would have been. I immediately contacted the insurance company and informed them that this must have been a mistake as you didn’t have to have extensive experience to see that this was way below a reasonable number. They contacted the adjuster to discuss the loss and then actually refused to meet with us at the property stating that the adjuster was confident in their estimate. …In the end, Mr. Roover got us more than six times the amount of money the insurance company originally offered… – Herold Hinds, Jupiter Florida. We immediately invoked the Appraisal Provision of the policy. Upon them naming their appraiser and agreeing to an Umpire, I met with the appraiser at the property. He looked at me with a bit of a grin and said, “I think this guy left off a bunch of stuff”. After going back and forth with their appraiser he was willing to settle the claim for $45,000 which is almost 5X their original offer and this is from their own appraiser! As much as that was now what I would consider a ‘reasonable’ offer it was still not satisfactory. We agreed to disagree and bring in an independent umpire to settle the dispute. The umpire agreed it was still too low and awarded $59,989.00 for this loss. That was a 642% increase over their original offer that they were not willing to budge from. Needless to say, we now have a very happy client that has already referred us to a friend and family. He wrote a very nice testimonial as well that can read by clicking the link. I always recommend bringing in a Public Adjuster at the beginning of the claim process as it can help avoid potential pitfalls and in a case such as this one, it may have shaved off a couple of months of waiting. FREE CLAIM REVIEW with a Florida Public Adjuster – Call: 800-801-2099. Whatever you do, do not settle for less than you deserve. You pay your full premium and in the event of a loss, you should recover your full settlement.